Much of the work of ACS is done in a laboratory setting. ACS conducts analyses of museum collections, consultation on museum displays and exhibits, and has a strong background in academic experimental studies. The Daley collection includes more than 5,000 individual items gathered by an avocational archaeologist for over 60 years. The analysis performed on the collection far exceeds that which is normally conducted for similar studies, with a specialized database generated for each material type. 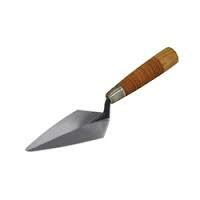 There are 40 variables recorded for individual projectile points, for instance, including those regarding provenience, typology, chronology, form, and metric characteristics. 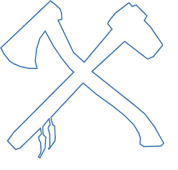 This detailed database allows analysts to conduct exploratory statistical research which may help resolve academic issues such as when the bow and arrow was introduced into the region, or how settlement systems of people represented by the Susquehanna and Small-Stemmed traditions may have varied. ACS additionally created a display format which served to provide an educational experience for visitors. Methods of chemical and physical examination in this study included scanning electron microscopy (SEM), electron microprobe analysis, X-ray diffraction, and thermal gravimetric analysis. Experimentation on fresh chert consisted of controlling and accelerating several environmental conditions (e.g. temperature, moisture, and pH) in order to reproduce the observed effects. Finally, an analysis was performed which attempted to correlate type and extent of weathering on artifacts from Paleolithic sites of the Near East with independent assessments of antiquity and paleoenvironmental setting. 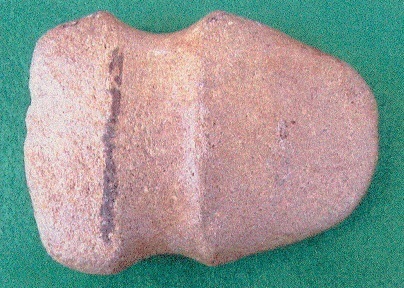 While many past authors have simply referred to traces of weathering on lithic artifacts as "patina", it has become clear that specific environmental and material conditions produce unique weathering effects. The directors of ACS conducted an extensive examination of lithic weathering patterns through various analytical laboratory procedures and experimentation. The common dependency on surface conditions for dissolution to take place has foiled past attempts to accurately predict the antiquity or paleoenvironments of chert artifacts based on its presence or extent, although the process is a useful indicator of site formation processes such as stratigraphic deflation. This study also identified observable qualities which can be used to distinguish dissolution and reprecipitation from other principal weathering forms, including desert varnish, mineral staining, encrustation, leaching, abrasion, and frost-fracturing. Finally, the observed redistribution of loosely bound silica particles resulting from fluctuations in heat has also helped to reveal the elusive and long-debated mechanisms associated with the culturally induced heat treatment of lithic artifacts. The study concentrated on dissolution, an invasive process which affects silicate materials subject to semi-arid and alkaline conditions. Chert artifacts which are exposed to these conditions at the surface for an extended period of time display a consistent whitening, and often with a clear, glossy surface. Daily heating and cooling pumps available alkaline moisture through capillary structures of chert material, the interior walls of which are dissolved. The pumping action further causes the reprecipitation of the dissolved silica at the surface of these artifacts where the solution is subject to evaporation. 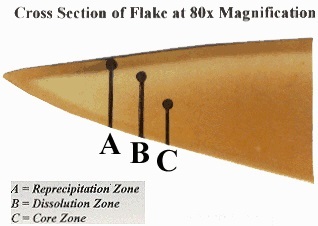 Magnified cross-section of a lithic flake showing the effects of 'dissolution', including an outer repricipitation zone, the dissolution zone, and an interior or core zone reflecting the original qualities of the chert raw material. A director of ACS (Dorothy N. Walwer) conducted an experiment gauging the effects of carnivores on skeletal remains. Large quantities of recently defleshed animal bone were distributed to different carnivores in the St. Louis Zoo in Missouri, including lions, tigers, cheetahs, jaguars, and spectacled bear. The bones were subsequently collected and examined through a binocular microscope in order to record patterns of gnaw marks. 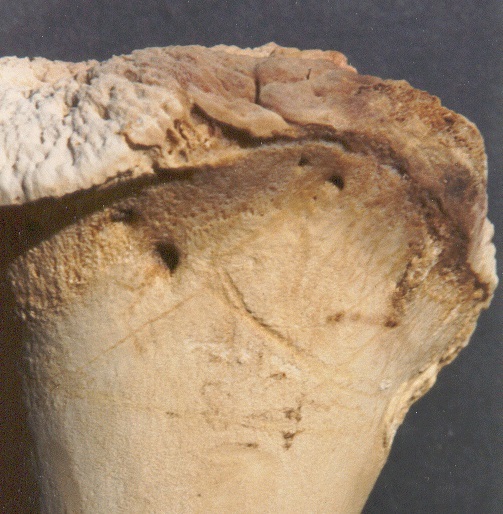 Carnivore gnaw marks tend to occur at the articular ends of bones, affecting proportions of skeletal elements recovered from archaeological sites. Different animals leave different types of gnaw marks on bone depending upon the characteristics of their dentition and feeding behavior. Rodents, for instance, tend to leave wide, flat channels across all parts of a bone, while many carnivores tend to leave deeper U-shaped striations on the articular ends which may become completely consumed. This variability can translate into a skewed skeletal profile for an archaeological assemblage, and in turn may distort interpretations of hunter-gatherer procurement and processing methods. Further, a distinction between carnivore gnaw marks and human-derived, V-shaped cut marks from lithic tools is essential, as both tend to be concentrated towards articular ends of skeletal elements. This study resulted in the production of a useful visual guide delineating the effects of different taphonomic processes, thereby allowing analysts to more accurately reconstruct past patterns of human dietary behavior. 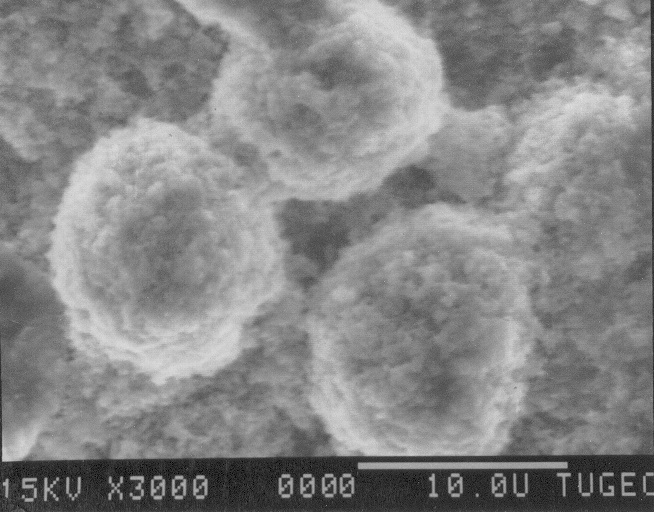 Scanning electron microscope (SEM) image at 3000- times magnification shows 'lepispheres' or accumulations of loosely bound silica particles in the dissolution zone of a weathered chert artifact. A faunal study was conducted in an attempt to help document "taphonomic" processes, or those forces which affect animal bone in the archaeological record. This is a critical concern in cases where post-depositional forces may alter the nature of skeletal remains at sites, and thus the interpretations of issues such as human diet and resource procurement strategies. ACS completed a large inventory of the Barney Daley Collection being housed at Wood Memorial Library in South Windsor, Connecticut. Material collected from the surface of agricultural lots along the Connecticut River includes a plethora of projectile points and other percussed lithic tools, groundstone items, and aboriginal ceramics. These artifacts represent nearly 10,000 years of prehistoric occupation in the region, ranging from the Early Archaic through Late Woodland periods.